Business is booming during this recession and we have customers for you. We are the world's largest and the technology leader In the wheel repair industry. 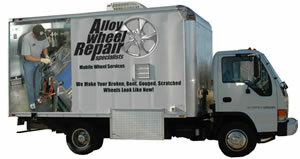 We specialize in the on-site repair of alloy wheels. We also remanufacture and replace wheels from our state of the art remanufacturing plants located around the world. AWRS is a car lovers dream business. High earning potential! Very Profitable !! On-site alloy wheel service for car dealers, body shops, and tire stores. Partner with our national accounts in your territory including Auto Nation, Car Max, All State Insurance, Progressive Insurance, Discount Tire, NTB, Hertz, Avis, Enterprise Car Rental and more !! Limited competition. There is no company that can compete with us. Expansion opportunity to open a remanufacturing plant and serve other AWRS franchisees. Industry alliance with AutoXcel – on-site repair of paint, dent and interiors. Patented and patent-pending equipment. Proprietary Processes!! Includes exclusive territory, equipment, products, and training. Franchise Fee starts at $35,000.00. AWRS is a fully mobile wheel repair service operating in 500 cities in the United States, Canada, England, Ireland, Saudi Arabia, Spain, and Germany. Master franchises available in Europe and Asia . AWRS franchisees currently service over 8,000 franchised car dealerships and thousands of independent dealers, body shops, tire stores, and repair centers. AWRS repairs over 50,000 wheels per month and is considered one of the world's largest and fastest growing service companies in the automotive reconditioning industry. AWRS is affiliated with AutoXcel which offers paint, dent, and interior repair franchisees. AWRS NitroFill is the company's newest franchise offering. It is expected to be released in Spring of 09. Wheel Refinishing - Alloy Wheel Repair Specialists provides a professional alloy wheel refinishing service right on location. Wheel Straightening - Alloy Wheel Repair Specialists repairs bent or out-of-round wheels leaking air or causing vibrations right on location. Wheel Remanufacturing - Wheels deemed un-repairable in the mobile unit or wheels requiring machining are shipped to an AWRS reman plants where they undergo repair and refinishing processes rivaling the quality of OEM wheels. Wheels not safe to repair can be replaced from an inventory of over 50,000 wheels. Other Services - Color match wheels to the car on OEM or after market chrome wheels. Insurance Service Contracts - participate as the repair network for special F&I products sold at auto dealerships; road hazard insurance for tire and wheel; and StayNu Service contracts for paint, dent, interior and wheel repair. Inspection Services - Inspect damaged tires and wheels for road hazard Insurers. AutoXcel - Paint, dent, interior repair franchises. AWRS franchisees team up with local AutoXcel franchisees to service major auto dealerships, tire stores, and other retailers. This is the only comprehensive service offer of its kind in the world. AWRS NitroFill - This new offering provides auto dealerships with nitrogen equipment on a revenue sharing program. Our investor owns the machine. Mr. Thomas Morris founded Alloy Wheel Repair Specialists, Inc in 2001. He became aware of this rapidly developing new market as his company at that time marketed paint, dent, and interior repair Franchises. Dealerships began to ask if our company could repair damaged alloy wheels incurred by curb damage. There was not a quick solution at that time as the only alternative was to ship the wheels to a shop. This required the dealer to dismount and ship the damaged wheel. The turnaround time could take three to five days at a considerable cost, not to mention the inconvenience and down time. Recognizing a huge opportunity, AWRS developed a system which gives the operator the ability to repair a wheel on-site at any location and in any climate condition, and in some cases, even without removing the wheel from the car. AWRS quickly grew and instantly was recognized as the leader in this new industry. Initially, AWRS sold licenses and converted to franchising in 2004. This ensured uniformity, which allowed the company to partner with such national organizations as Car Max, Auto Nation, State Farm, Progressive Insurance, Discount Tire, Hertz, and Avis. On a regular basis, AWRS and its franchisees sought to upgrade their equipment and processes. As manufacturers change their styles and colors. AWRS corporate personnel quickly capture these new paint codes to keep its network up to date. In 2005, a mobile wheel straightening system, known as "The New Bee," was developed to enable the operator to straighten severely "out of round" wheels while the tire remains only partially separated from the bead. This invention was later patented and allowed our network to offer safe and precise on-site wheel straightening. This has become a significant portion of its revenue. In 2006, several franchisees opened remanufacturing plants. These plants provide enhanced solutions to address damaged wheels cracked or leaking air. AWRS became – and remains – the only complete mobile and remanufacturing solution. Click on Request Information for FREE info on how to open a Alloy Wheel Repair Specialists franchise today! Please Note: This Alloy Wheel Repair Specialists franchise opportunity and other franchise business opportunities, businesses and franchises for sale on this web site are not to be considered as an "offering", "franchise offering", suggestion or recommendation by Franchise Leader™. This advertisement depends entirely on the truthfulness of the information provided by our advertisers which includes, but is not limited to, franchisers, franchise brokers, franchise consultants and business brokers. Franchise Leader™ recommends that you consult a lawyer, financial consultant, accountant or professional advisor before buying a franchise or business opportunity or any type of business. By using this form or any part of our website, you have agreed to all terms and conditions of Franchise Leader™. Please review our Terms & Conditions for more information.